Fantastic multi function Italian leather shoulder bag. This versatile handbag has a long adjustable shoulder straps that pull through to make this into a really useful rucksack or backpack bag in one simple action. 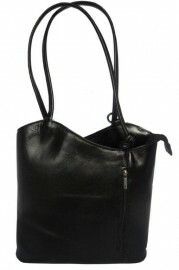 The main handbag has three separate compartments, one internal zipped pocket and a mobile phone pocket. The handbag also has two outside zip pockets. Dimensions: L26cm H28cm D8cm. Available in black or chocolate brown. Kindly NOTE: All our Leather items are created out of genuine Leather subsequently there may now and again be a contrast in tone and colour on the surface of the leather or it may have characteristic inclusions which is common of a genuine Leather items.